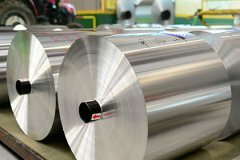 8079 aluminum foil is a flexible and unique metal with soft temper and attractive surface. It is an ideal product for applications requiring higher tensile strength materials which are not compromised during the drug packaging processes. The combination of the 8079 alloy and H18 temper provides optimal performance in pharmaceutical foil. Alloy 8079 foil is also widely used in the food packaging industry, beer mark, and household foil, bottle cap, etc.